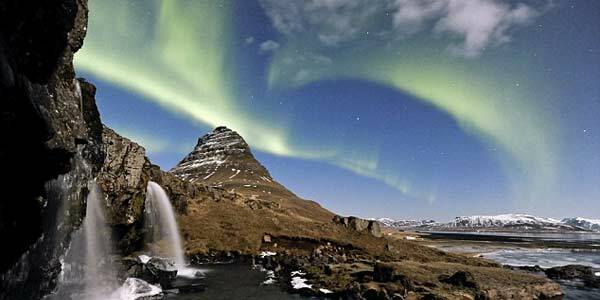 At first glance, the picture stunning Aurora Borealis is expected to be taken during the day. But who would have thought, blue sky created by the stunning full moon. Kerstin Langenberg photographers managed to catch the Northern Lights that after spending 300 hours to catch this natural phenomena in Iceland. The picture managed to reveal the beautiful scenery of mystical Þingvellir National Park, one of UNESCO World Heritage Site. Curtain light bright green and purple create a snow-covered mountains looked on and seemed like an alien world. Langenberg, 28, from Germany who is now settled in Iceland, said: "Northern Lights can not be observed in the daytime and not bright enough. However, the aurora will be a fantastic sight when the moon lit up the sky and land. " Aurora, according to Langenberg, looks bright with color because reflected light striking the moon. This is a very rare sight. Auroral light that appeared suddenly and lasts a few seconds before disappearing without a trace. "It's very difficult to predict the aurora. I've been very happy if it managed to get two very good pictures in one night. Aurora only appears a few seconds and then disappear. We never know, "said Langenberger. Aurora comes from solar energy released particles that fell 90 miles above Earth.